Hello, Intended Parents or hopeful surrogate mothers. If you’ve been researching the topic of surrogacy long enough, or you are currently in the process of finding a surrogate or you are currently in a surrogacy contract- you know that there are many terms you may not be familiar with. Traditional Surrogacy: The surrogate is inseminated with either the intended father’s sperm (to be matched with her egg) or donor sperm. The surrogate mother is related to the child genetically. Gestational Surrogacy: An embryo created through the process of in vitro fertilization (IVF) is transferred into the uterus of the surrogate by a simple procedure. The surrogate is not genetically related to the child, and a surrogacy arrangement is agreed and signed between the surrogate mother and the intended parents which establishes parentage. During this process of surrogacy, the egg and sperm used to create the embryo most likely came from the intended parents or may have been donated from either sperm or egg donors. Canceled Cycle: An assisted reproductive cycle in which ovarian stimulation was carried out but which stopped before eggs were retrieved. Mock Cycle: When a doctor puts a surrogate mother on full or partial medications to see how her body will respond. They do this with the clear intent not to transfer the embryo. The surrogate mother is compensated for this. Dropped Cycle: This is when the surrogate has taken all of her medication in preparation of a transfer, but the cycle is cancelled. The surrogate mother is compensated for this. 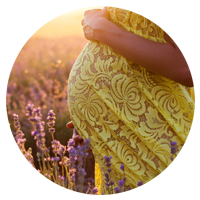 Surrogate Compensation Package: A list of benefits the surrogate mother receives in addition to her base compensation. This can include compensation for travel, child care, and monthly doctor appointment visits. Legal Contracts: The phase of the surrogacy process where intended parents and surrogate mother sign a surrogacy agreement. Surrogacy Arrangement: The legal agreement between surrogate mother and intended parents for purposes of having a child. It establishes clear contractual guidelines and parentage in order to avoid conflicts between two parties. Egg retrieval: the process to retrieve eggs from the donor or intended parent’s ovaries. IVF (In Vitro Fertilization): An ART procedure that involves removing eggs from the intended parent’s ovaries or egg donor’s ovaries and fertilizing them outside of the woman’s body. The eggs are fertilized using sperm from a donor or intended parent and the fertilized eggs create embryos. Embryo: The result of IVF whereby sperm and eggs are fertilized outside the uterus to form a human baby. This embryo is then transferred in the surrogate mother’s uterus by process of embryo transfer. Gestation: The period of time from conception of the embryo to birth of the child. Miscarriage: A pregnancy ending in the spontaneous loss of the embryo or fetus before 20 weeks of gestation. Ultrasound: A technique used in assisted reproduction and also normal births to visualize follicles in the ovaries, or visualize the growing child in the womb.